FREE GIFT for our Kindle Reviewers until 2/1! This book will be heartily enjoyed by Canadians, of course, but is a must-read for all students, especially Americans. Canada, the second largest of all nations on our planet, is also one of the most over-looked. Its history is all-but-forgotten in world history textbooks and its people largely ignored. This is surprising and unthinkable, for the story of this broad and gorgeous nation is also fascinating and world-changing. "O Canada! is a terrific "living history" book with true stories from across this beautiful country of ours. I am Canadian, and I learned quite a bit - even about things I'd never heard of before, which surprised me! My particular favourite is "Canada's School on Wheels" - about the first ever travel-schooling. We will be using this book in our homeschool history & geography studies this year, and I know the chapter on vikings (and their dogs) will be a big hit with my two children especially. Just one note of caution to parents [with especially tender-hearted children] - true stories can be very sad at times." - Kimberly C.
"O Canada! 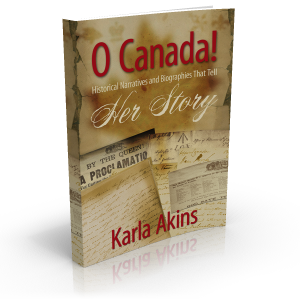 is a glimpse into the interesting stories in Canadian History. My Littles loved the story of Bjorn the Lundehund, and were amazed at the tale of Canada’s School on Wheels. There are stories of Canadian History that even their history-buff Mom didn’t know! Ms. Akins is a courageous writer to have taken unique approaches to each story, which is new and refreshing. I’m sure this will be a special book on our shelves for years to come!" - Shannon R.
Read a more thorough review here!